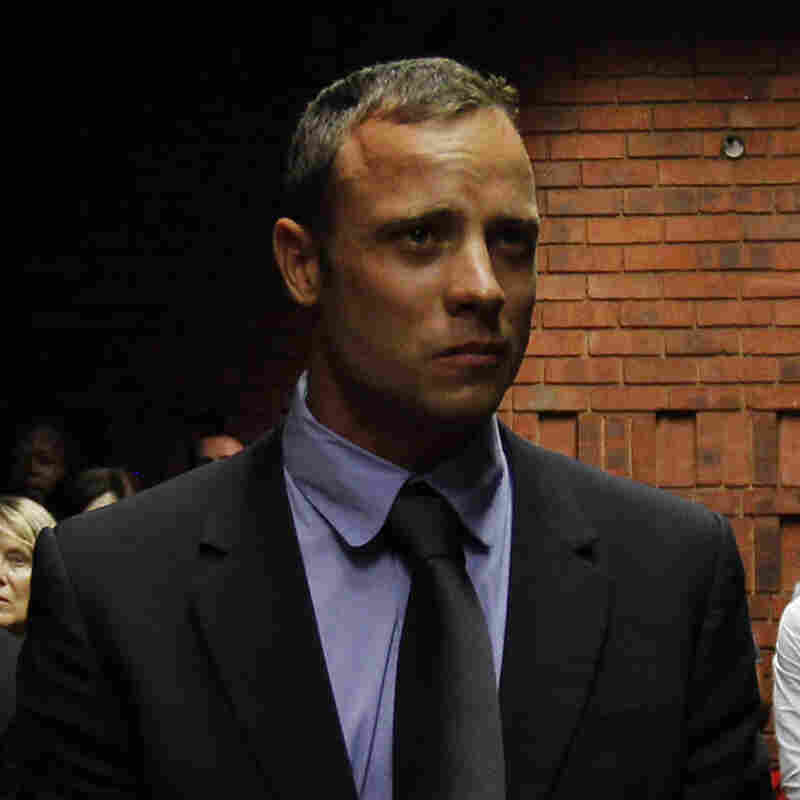 Pistorius Says He Feared For His Life; Prosecutor Says Shooting Was Premeditated : The Two-Way Olympic and Paralympic sprinter Oscar Pistorius has been charged with premeditated murder in the death of his girlfriend, Reeva Steenkamp. Pistorius says he "had no intention to kill my girlfriend." South African prosecutors laid out their case Tuesday against sprinter Oscar Pistorius, charging that the Olympic and Paralympic athlete committed premeditated murder on Valentine's Day when he allegedly rose from bed, put on his prosthetic legs, walked to a locked bathroom door and fired through it four times — killing his girlfriend, model Reeva Steenkamp. Oscar Pistorius in a Pretoria court Tuesday. But Pistorius, a hero to millions around the world because he is the first double amputee to compete in a Summer Olympics, said in a statement relayed by his lawyer that "I had no intention to kill my girlfriend." In court today, as NPR's Gregory Warner tells our Newscast desk, Pistorius "sobbed as his lawyer said he did not know his girlfriend was the person behind that door." And in an affidavit read in court, as NBC News reports, Pistorius says he "heard a noise in my bathroom ... I felt a sense of terror... I believed that someone had entered my house... I grabbed my 9mm pistol. ... As I did not have my prosthetic legs on I felt extremely vulnerable. I had to protect Reeva and myself... I had limited mobility on my stumps." According to live-blogging from The Guardian, in his affidavit Pistorius indicates he did not take time to put on his prosthetic legs. He describes hearing a noise in the bathroom, getting his handgun from beneath his bed, screaming at the person inside the bathroom to leave and then firing through the door. "I thought Reeva was in bed," Pistorius says in the affidavit, according to the Guardian. Immediately after the news of Steenkamp's death, there were reports that Pistorius might have mistaken her for an intruder. But South Africa's News 24 reports that prosecutor Gerrie Nel today "submitted that Steenkamp's death was pre-meditated murder, rejecting an explanation that Pistorius had mistaken Steenkamp for a burglar." Pistorius, 26, was born without fibula bones below his knees, and his parents chose to have his legs amputated below the knees when he was an infant. He's known as the "blade runner" because of the carbon-fiber prosthetic legs he uses. Steenkamp, 29, was laid to rest today. Pistorius' alleged crime is being treated as a "schedule six offense," News 24 says, which under South African law deals with "extremely serious" crimes. If convicted, he could get life in prison. CBS News writes that in his affidavit, Pistorius says "he felt vulnerable because he did not have on his prosthetic legs when he pumped bullets into the locked bathroom door. Then, Pistorius said in the sworn statement, he realized that model Reeva Steenkamp was not in his bed. ... He put on his prosthetic legs, tried to kick down the door, then bashed it in with a cricket bat to find Steenkamp, 29, shot inside. He said he ran downstairs with her, but 'She died in my arms.' "